It is that quality of theatrical corruption that makes Chicago (my adopted hometown) the perfect setting for Boss, a new original series on STARZ (Fridays, 10/9c). 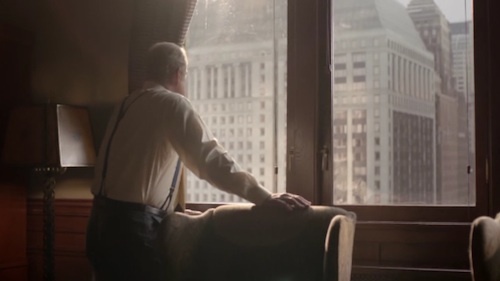 For, make no mistake, Chicago is every bit as much the central character of Boss as Baltimore was in The Wire, a show to which this series nobly aspires to resemble. Boss isn’t The Wire, of course—it is indeed more “theatrical” than David Simon’s series, and so more prone to the maudlin and melodramatic—but so far it is doing many very ambitious things right, and has the potential to be one of the best new shows of the year. Kane delivers this particular speech to Ben Zajac (Jeff Hephner), an ambitious young politician on his way up, whose youth and clean good looks suggest he is a very different creature from Kane. Beginning with the show’s title song, Robert Plant’s version of “Satan Your Kingdom Must Come Down,” there is every indication in Boss that Kane represents the last of the old order, a fading king whose time—and methods—are coming to an end. So Boss will deal with Kane’s struggles—both personal and political—to hold onto his power, and the first episode does an impressive job of showing what this will entail: I can think of few pilots that demonstrate so effectively—and so promisingly—what their series will be about. We also see Kane fighting for one of the keystones of his legacy: a major expansion of O’Hare International Airport that has been in the works for all 22 years he’s been in office. Now, when a construction crew begins moving an historic graveyard to make room for a new runway, the discover of an archaeologically important Native American site threatens to torpedo this project. It’s a contrived plot device, but it’s also a clever one, as it cuts across several of the city’s various power blocs—financial, ethnic, municipal, religious, and labor—that Kane must navigate and manipulate to achieve his goals. For example, the Latino work crew that unearthed—and blabbed about—the site leads Kane to turn the screws one of Alderman Lalo Mata (Ricardo Gutierrez), a leader of the Latino community from which Kane demands and receives a gruesome token of loyalty. What most impressed me about this first episode—and gave me hope for the series as a whole—is how deftly and confidently Safinia interweaves the various aspects of municipal life, and does so through characters who are believable and intriguing. The mayor’s estranged daughter, Emma (Hannah Ware), serves triple-duty as a liaison to future plotlines: she brings in religion (she is a rector in the Episcopal Church), health-care (she helps run a free clinic), and the drug trade (it is suggested that Emma has had drug problems in the past, and in this first episode establishes a relationship with a young dealer named Darius [Rotimi Akinosho]). We are also given a glimpse of the fourth estate, as reporter Sam Miller (Troy Garity) is chasing the story of Kane’s illness. Moving back and forth between these various cross-sections of the city sometimes make the first episode of Boss feel like a simplified, highly-condensed version of all five seasons of The Wire, but such ambition and scope are to the show’s credit. Though obviously putting all of these pieces in place, “Listen” does a remarkable job of making these microcosmic stories feel organic, while introducing us to intriguing major and minor characters along the way. To me, Boss is at its best when it’s dealing smartly and realistically with city politics: for all the movies and television shows about politicians, I don’t know that anyone has attempted to explore the actual power dynamics of political strength in quite the same way Safinia is attempting here, and if he pulls it off this promises to be a fascinating series. Where this episode worries me a little is in its more melodramatic flourishes: there is a sexual encounter between Robertson’s character Kitty and the clean-cut Zajac that seems to come from nowhere, for example, and Donovan’s character sends Kane’s doctor a “gentle reminder” about confidentiality that feels like it belongs in Dexter. These scenes, and a few other personal storylines, feel like they’ve been inserted to keep the attention of people who may be bored by city council meetings and political wrangling. Whether Boss fulfills its considerable potential will largely depend on its ability to balance its sophisticated and sensationalistic elements, and whether Safinia and Van Sant are willing to risk attracting a smaller audience in order to achieve a better, smarter show. If they continue to aim high, Boss could be something special.